My dressing table can get really messy so I wanted to look into ways of organising all of my makeup brushes, nail art tools and eye-liners. I like the acrylic cosmetic holders you can buy and reviewed the nail polish acrylic holders here as it was such a great buy and just the right storage for my nail polishes. 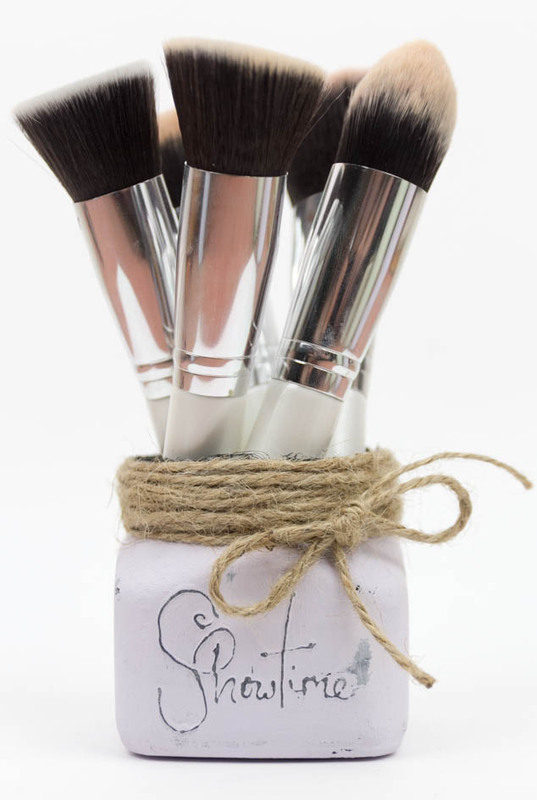 For my brushes I wanted something a bit prettier and more personal as they will be going on my dressing table. 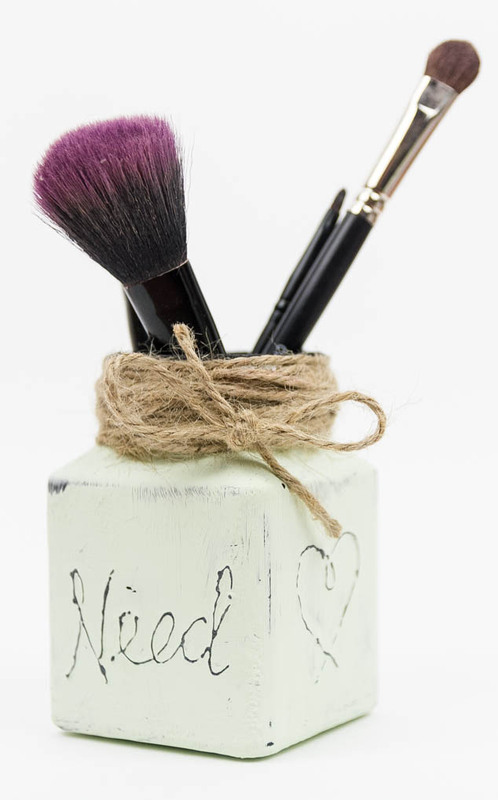 I looked on Pinterest at different DIY Makeup holder ideas and decided I was going to decorate different sized jam jars to create the holders. 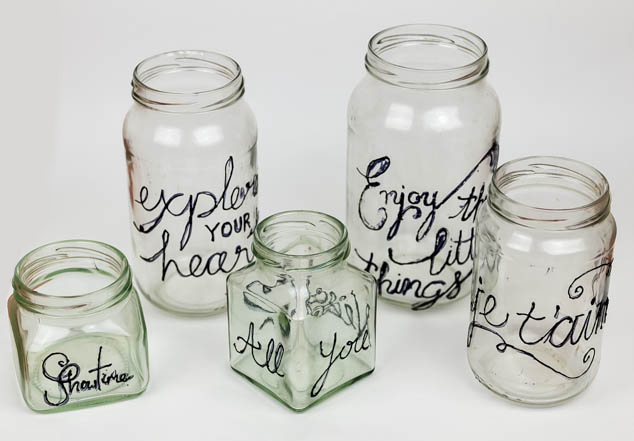 I found different expressions and typography I liked online and copied the phrase onto the clean jam jars with a Sharpie. 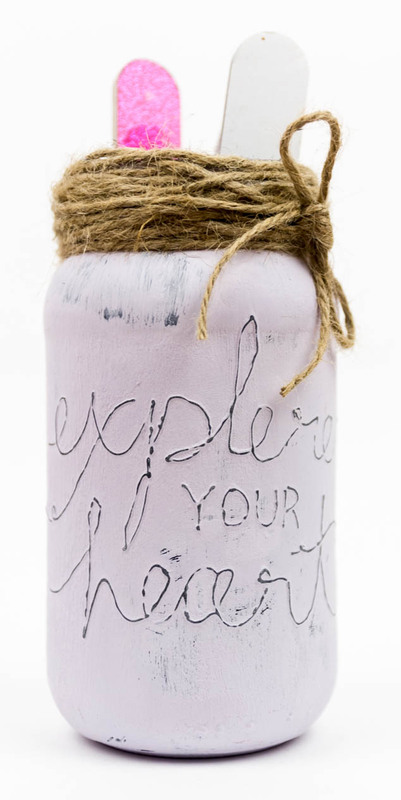 I then used the Pebeo Vitrea 160 Transparent Outliner to draw over the Sharpie outline to raise the text from the Jam Jar. I initially tried going over the writing with a Glue Gun but it was so much harder, inaccurate and looked messier. The Pebeo Vitrea 160 Transparent Outliner was a little fiddly but gave good even results and was quick to apply. I left the Pebeo Vitrea 160 Transparent Outliner to dry for 24 hours and then put in the oven for 40 minutes at 160 degrees. I went to B&Q and bought 4 matt paint tester pots in Value Green, Value Blue, Colours Soft Black, Colours Marshmallow. I also bought a cheap Paint Brush and a Coarse Sanding Sponge. I painted the insides of my jam jars in Soft Black left for an hour and applied a second coat. 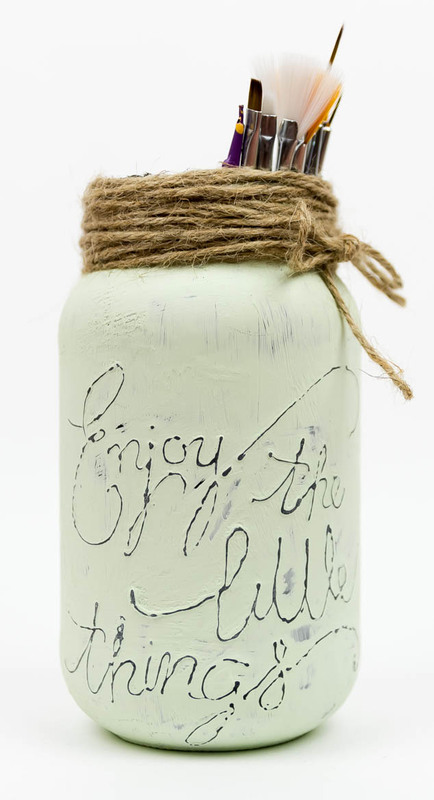 I then painted the outside of the embossed jam jars all over with 2 coats of the coloured matt paints. Once dry I used the Coarse Sanding Sponge over the writing to remove the paint and let the Pebeo Vitrea 160 Transparent Outliner layer show through. 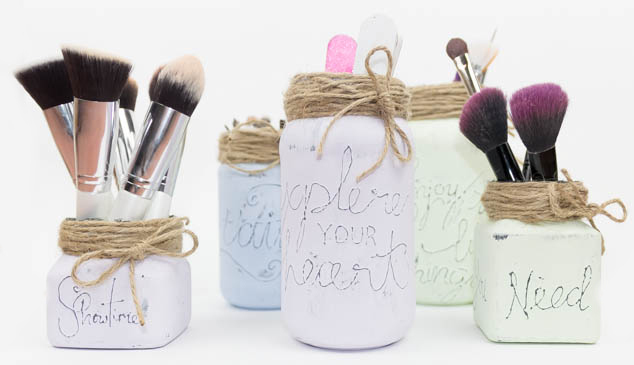 I also sanded in different areas of the jam jars gently to make them distressed. 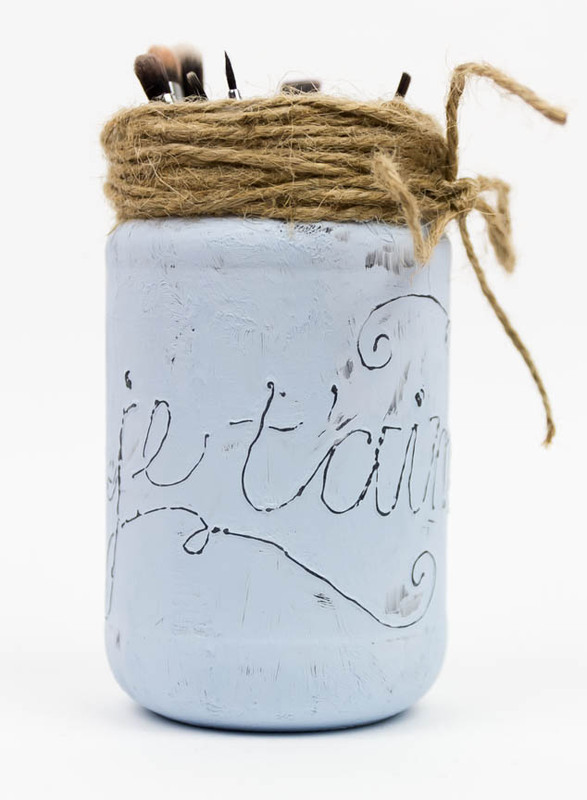 I neatened up the top of the jar by using a Glue Gun to stick on the Rustic Twine, wrapping the Twine around and then giving it a bow at the front. 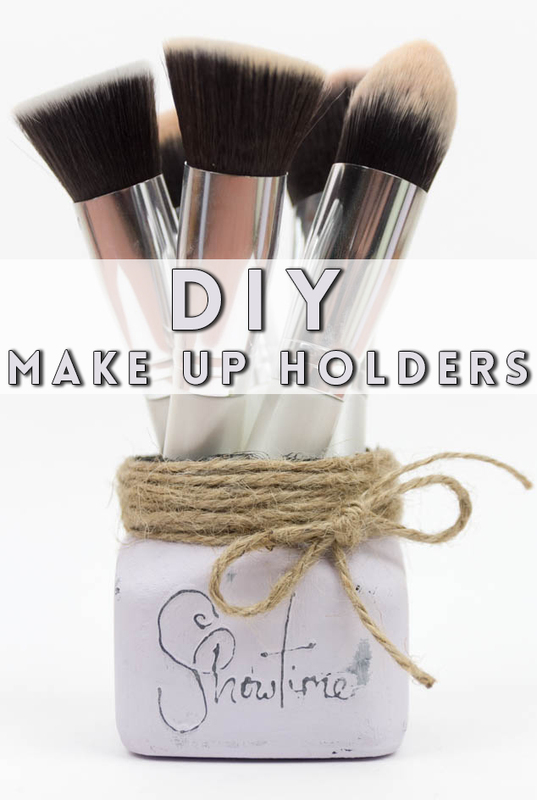 I hope my Makeup Holder Ideas have inspired you, if you want to see any more of my DIY Projects they can be found here and if there is anything you would like to see me create in the future please leave them in the comments below.